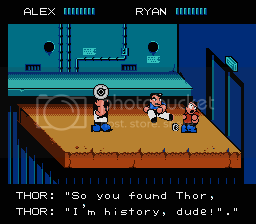 This is a TAS of River City Ransom. It's 130 seconds faster than the current published run, due to better precision, more use of weapons, and new glitches. It's a little slower than the last submission in movie time, but the last boss dies faster. adelikat: Accepting for publication to obsolete the published movie.